Here at Status-Q headquarters, we’re having a new bathroom fitted, which means we’re getting all these newfangled gadgets that you youngsters just take for granted. Things like mixer taps, which our international friends are amused that we didn’t adopt about 50 years ago. I tell them that British plumbing is like the weather: it’s unpredictable, and we like it that way, because it gives us something to make polite conversation about when inspiration is otherwise lacking. It appears from visual inspection that the small button provides a smaller flush than the big one (these things are difficult to measure, but that seems sensible). But what happens if you press both, which is the easiest thing for my chunky fingers? Are they additive in some way, producing a megaflush? Or is that the same as the big button alone? If the authorities really want us to save water, shouldn’t the big easy-to-press button be the one that does the smaller flush, leaving you to add on the side button for the full monty? In any of the above combinations, does a press-and-hold give you any more than a brief press? 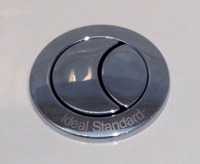 Is there an international standard for flush-button-operation, or might all of the above vary by manufacturer? How many unnecessary gallons of water are used around the world each day by people like me who, in the absence of such vital information, always press the biggest combination of buttons for the longest amount of time? Can Status-Q make a significant impact on world water consumption?